Twice within recent weeks I have had to preach in the dark when lightning struck transformers just before service time (Galena, Indiana) or just after the sermon began (Marshall’s Branch near Virgie, Kentucky). At Galena, there were windows in the building and we had a sort of twilight. We sang from memory. There was not enough light to read and so an outline would have been useless, neither could I see the Bible to read it. At Marshall’s Branch the lights flickered during the singing. When I arose to preach, I told the audience to just stay put if the lights went out and I would preach with or without lights. I soon had my chance. Just after beginning, off went the lights (stayed off for many hours over a wide area). Did you ever try to preach a sermon from a cloth chart in the dark? As I continued, one of the brethren brought in a huge flashlight. David Thacker sat on the front row and held the light on the chart. It was like having a spot light. The audience remained calm, even the children, and several said they would long remember the service. I am thankful for teachers many years ago who insisted on a great amount of memory work in the Scriptures. A couple of thoughts to pass on: (1) You can’t tell who goes to sleep; (2) I have been convinced for a long time that many preachers preach in the dark all the time for they are ignorant of the word of God. Your word is a lamp to my feet and a light to my path (Ps. 119:105). Furthermore, we made the agreement that there would be no personal reflections of any kind upon anyone, that everyone would be treated with absolute fairness, and that we would recognize one another as brethren. Of course, we recognize that you think we are wrong, — and we believe you are wrong. We would not be here if this were not so. Yet, we recognize each other as brethren. Each one of us comes into this meeting with the understanding that all of us are sincere in that for which we are contending. Hence, we shall not only recognize one another as brethren, but as sincere brethren, each person honestly contending for what he believes to be the truth. We believe that all of us are big enough men and that we have enough respect for the Lord to engage in a discussion of this kind in this spirit and attitude. With reference to the results, we have qualified hopes. Some people ask us, “What do you hope to come from this?” I answer, “I do not know actually.” They ask, “How much good do you think will be accomplished?” I answer, “I do not know.” But, neither do I know the answer to this question when I stand up to preach. I honestly do not know how much good will come from this meeting, but it is certainly never wrong for brethren who profess to serve a common Lord in a common cause to sit down and discuss their differences with one another in the spirit and attitude which we have suggested for this meeting. We hope this will be a pleas- ant time for all of us and it will be a discussion such as will glorify God and benefit His cause in the world (The Arlington Meeting 13). We commend this spirit as worthy of emulation when- ever brethren find themselves drifting apart. Can you lift up your voice to the clouds, that an abundance of water may cover you? Can you send out lightnings, that they may go, and say to you, “Here we are”? (Job 38:34-35). I never hear it thunder, nor see the lightning flash but what I am made to realize how frail I am. Such a consideration should produce within us a profound respect for the God of the Universe and should completely amaze us when we think of his grace and mercy offered through our Lord Jesus Christ. 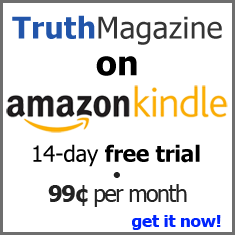 When you send your children to college you try to send along things you think they will need (or want), why not send them a subscription to Truth Magazine? It will give them some good material to help them spiritually. They are going to be exposed to many ideas, some of which will not be good for them. How about that son or daughter who is in military service? Could they not use such a subscription? When your children marry and form homes of their own, why not get them started on good reading material which will enter their home twice a month. Are they worth $19 a year to you? Want to do something nice for your preacher? Send him a gift subscription to Truth Magazine. Write to: Truth Magazine, P.O. Box 9670, Bowling Green, KY 42102 or call in your order at 1-800-428-0121.